Last December, Realmac Software launched LittleSnapper, an iPhoto-like utility for snapping, organizing, and sharing screenshots. If you don’t always have a Mac available with which to get snapping, though, LittleSnapper is now available in a convenient travel size for iPhone and iPod touch. 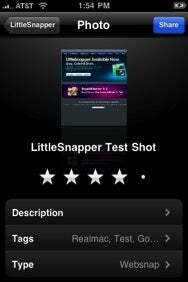 LittleSnapper for iPhone—maybe they should have called it "LittlerSnapper"—brings the most essential features of its big brother to the iPhone OS. You can use the iPhone’s camera to snap a photo, pull a photo from your device’s library, or capture a Web page via the program's built-in browser. You can then add a title, description, rating, tags, and specify a photo type (screenshot, websnap, illustration, etc.) to your images, then share them to QuickSnapper, Realmac Software’s image hosting and sharing service, or Twitter. LittleSnapper for iPhone offers a tag browser with type-ahead support, and it even supports linking to your QuickSnapper pictures via three popular iPhone OS Twitter clients: Tweetie, Twitterrific, and Twitterfon, in addition to Safari. It is worth noting that this 1.0 of LittleSnapper for iPhone does not yet offer a few features that users of its desktop counterpart may expect. Specifically, there are no editing or annotation tools, so you cannot crop or markup an image before saving it to your library or sharing online. There is no direct way to synchronize snaps with a desktop library, though you can upload to QuickSnapper, then use the site’s “Export to my LittleSnapper Library” feature in a desktop browser. Speaking of QuickSnapper, it is the only Web service that LittleSnapper for iPhone can share with; the desktop version supports Flickr and FTP/SFTP. Version 1.0 drawbacks aside, this is another iPhone app that I helped beta test and have been thoroughly enjoying. The ability to simultaneously upload a picture to QuickSnapper and share its link via Tweetie, all from my iPhone, is especially slick. You can check out LittleSnapper for iPhone’s full description and more screenshots in the App Store, and a copy can be yours for a mere $2.99.